Eight Days to Amish: Jersey Shore is back! Is Billy Joel, too? The Jersey shoreline is one of two American icons poised to make a spectacular comeback in the wake of meteorological devastation. The other is Billy Joel, our most disappointing artist from the past 20 years. I was on board with him from the 1977 release of “The Stranger” clear through the mid-1990s. And I had as much fun listening to him as I did to Bruce Springsteen, Tom Petty, The Rolling Stones or any other big band from rock’s golden era. He rocked with the very best of them. 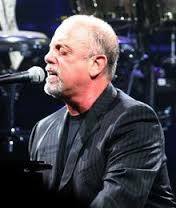 There was “You May Be Right,” “Only The Good Die Young,” “Piano Man,” “Big Shot,” “My Life,” “Goodnight Saigon,” “Pressure,” and “It’s Still Rock ‘n’ Roll To Me,” to name just a few of his 33 top 40 hits. He’s the third best-selling American solo artist in history behind Elvis and Garth Brooks. He achieved all this with just 11 studio albums scattered over 17 years. In rock star years, he’s still an adolescent. Then over the last 20 years he became more famous for being a Saturday Night Live punchline. He drank, he drove, he moped about in his Hampton boat shed. I heard him give the lamest excuse for his artistic recluseness. He didn’t want to “dilute” his catalogue. Like if he made one or two subpar albums it would diminish his legacy. Springsteen was lame for the entire 1990s and he remains our most essential rocker. So much of Billy Joel’s past is linked to Christie Brinkley. I contend Joel is in the beginning of a career resurgence that will lead him to be forever linked to another female name: Hurricane Sandy. He stole the show at the great 12.12.12 Sandy Relief Concert. The performance had interested observers asking when he’d get back on the road, if he was writing anything new and why such a great performer had stayed away for so long. Those weren’t just his fans. He told stories I’d never heard, like the one about his first date with his third future ex-wife, Katie. Thirty-two years his junior, she was unfamiliar with his fame. He took her to dinner, then to the theater to see “Moving Out,” the Broadway show based on his hits. At the end of the show, he went up on stage and sat in and played with the band for the finale. Maybe I’m just an old romantic, but something tells me Billy got laid that night. He just seems to be reconnecting with the feistiness so many of us always found so appealing. I know he’d never do it, but I’d love to hear him write a sequel to what was in 1990, his very last big hit, “We Didn’t Start the Fire,” one of the most catchy and compelling songs anyone’s ever written. Petty, Springsteen, Dylan, The Stones, Mark Knopfler and Van Morrison -- they are all still telling us stories that forever resonate. Springsteen’s “Wrecking Ball” from last year is fantastic and I’m alive with anticipation with the news that Petty’s putting the finishing touches on a new studio album set to be released in '14. By Joel’s standard these two should maybe have hit their rocker rockers when Springsteen released “Born to Run” in 1975 and Petty “Damn The Torpedoes” in ’79. Oh, the poorer those of us who love great music would be if they had. We can only hope this latest round of enthusiasm for Billy Joel will encourage him to sit down and write some fresh music about what’s been going on in one of rock’s most interesting minds. I think I’m going to stop now. I wouldn’t want to do anything to risk diluting my legacy. Joyful new additions to our (musical) family!